Our highly experienced team is always available to advise and assist you. 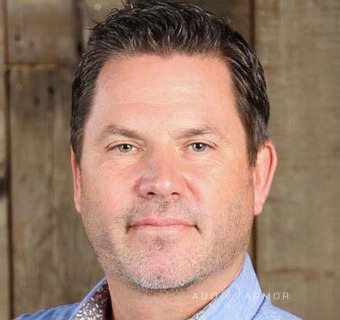 All clients have continuous customer service and absolute confidentiality before and after every sale. 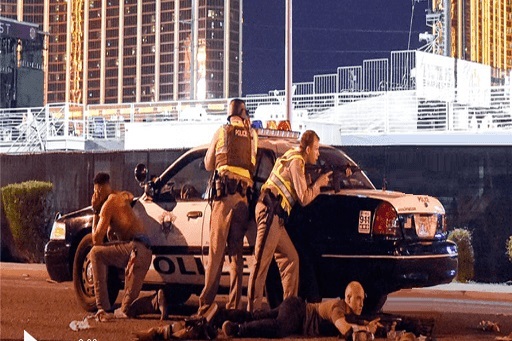 The ‘Anti-Intrusion Protection Package’ creates a mobile safe room that protects its occupants from criminals, terror attacks, active shooters, and civil unrest. 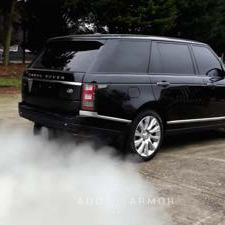 1) Replaces your vehicles factory installed windows with bullet resistant, shatter-proof glass. 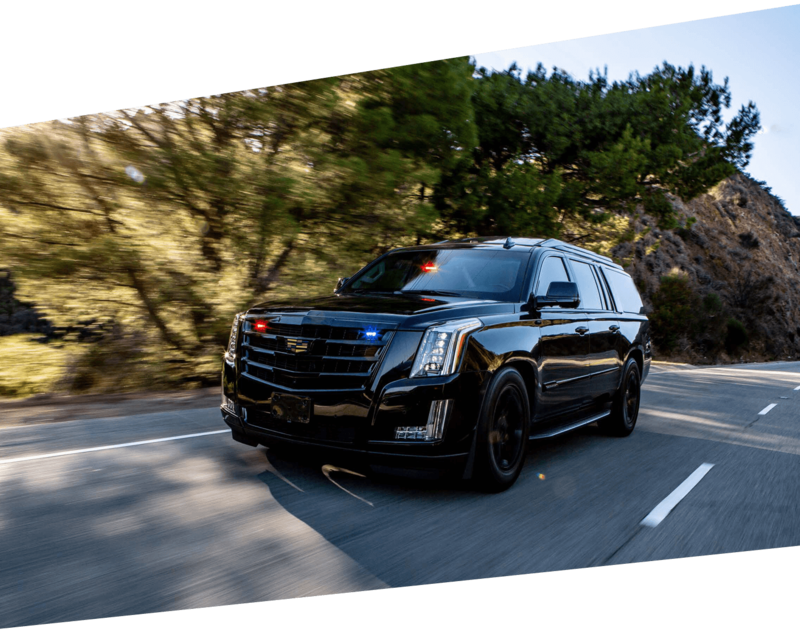 ‘Ballistic glass’ which is also referred to as “transparent armor” isn’t just a thicker version of your vehicle’s factory installed safety glass. 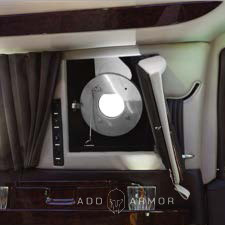 Add Armor uses a multi-layered sandwich of acrylic, polycarbonate (a type of plastic) and leaded glass. 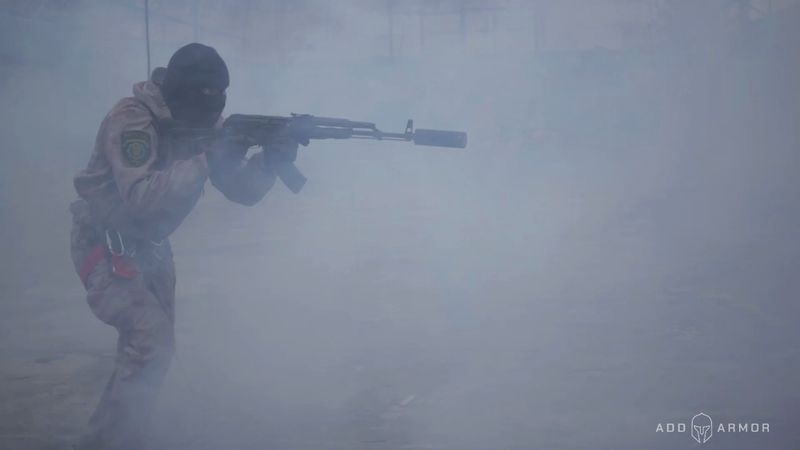 The thinnest option—0.8 inch—will stop subsonic rounds such as those from a 9mm or .44 magnum handgun as well as prolonged physical attacks from blunt objects such as bats and cinder blocks. The thickest glass—2.0 inches—will stop a sniper bullet from high-powered .30-06 rifle. How it works: Absorption of energy through controlled de-lamination. 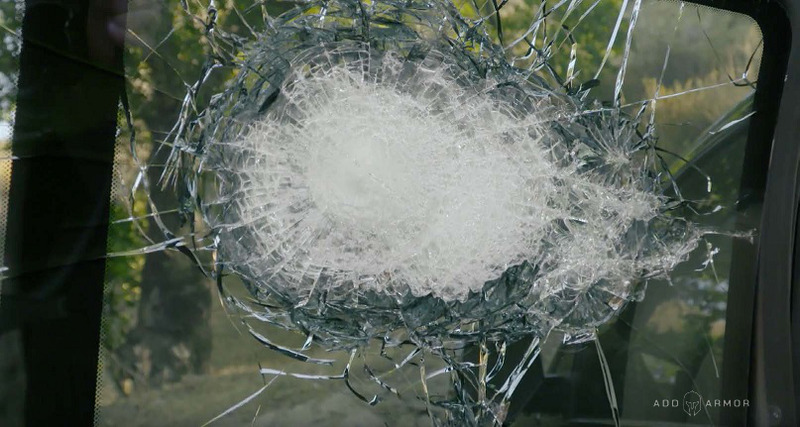 Multiple layers of leaded glass and acrylic slow down and disperse the energy of the projectile while the polycarbonate inner layer acts as an impenetrable elastic shield to protect passengers from spalls (shards of glass and bullet) that break off during impact. 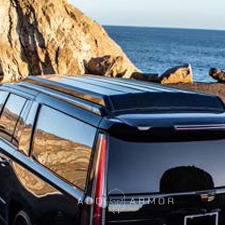 2) Fortify’s your vehicles doors by installing custom fit ballistic protection panels inside each door and hatch. 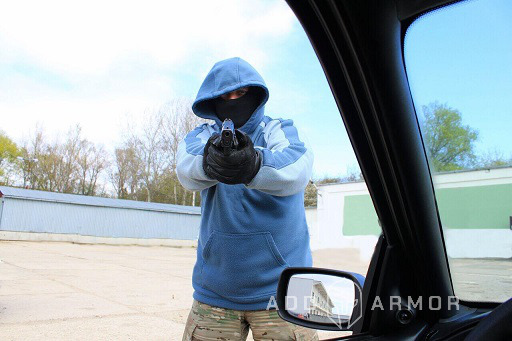 Ballistic protection panels are made up of ultra-light synthetic laminate materials that are 60% lighter and 10 times stronger than ballistic steel. 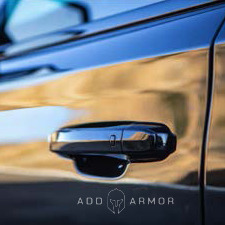 Add Armor’s proprietary designs and custom installation techniques combine maximum protection with minimal additional weight. 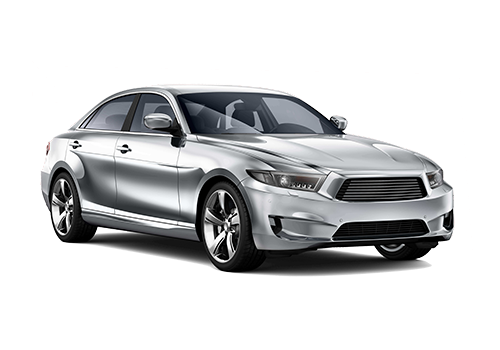 This retains the vehicle’s existing exterior appearance without compromising mechanical performance. How it works: Absorption of energy through controlled de-lamination. 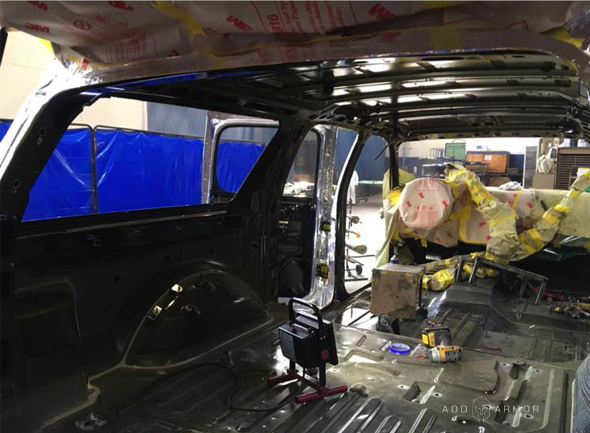 Multiple layers of resin-based fibers slow down and absorb the energy of the projectile to prevent it from penetrating into the passenger compartment. 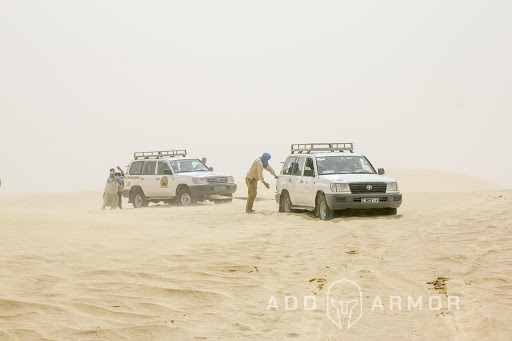 AddArmor offers the Full Protection Package for clients who want to mitigate higher-level threats such as kidnappings, car bombings, or for working and traveling in combat zones. 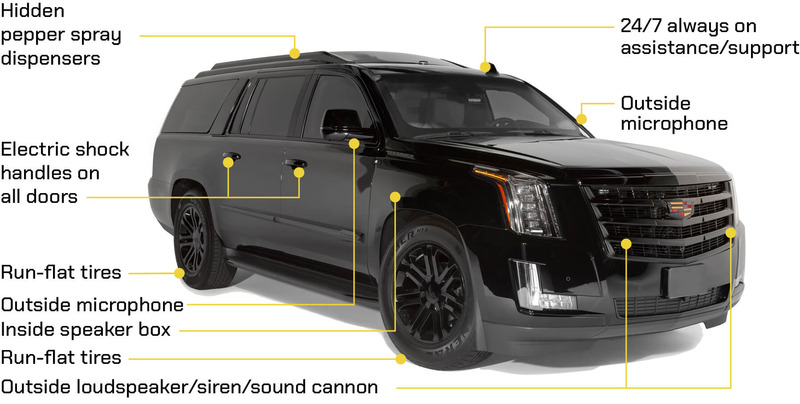 Full Protection vehicles are engineered to encase the entire passenger compartment in a seamless cocoon of ballistic protection. 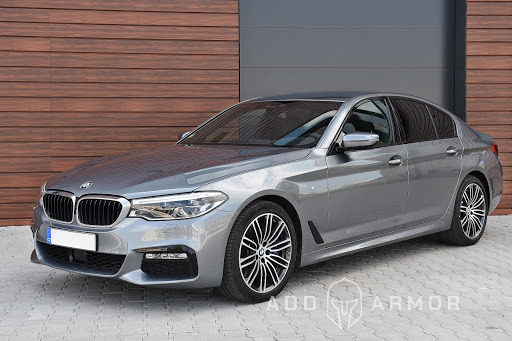 Full Protection features include premium run flat tires, bomb blankets, and ballistic protection for the major engine components such as: the radiator, battery, fuel tank, and the computer circuit boards in the Engine Control Module (ECM). 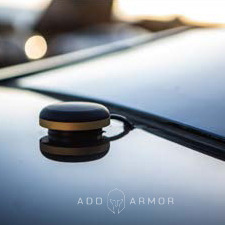 Other customized protection options are available upon request. 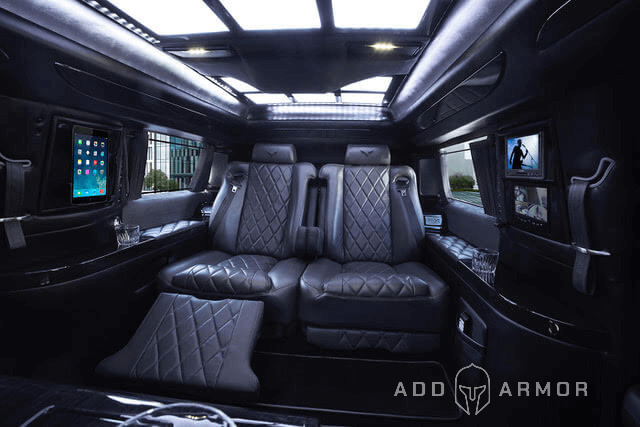 After AddArmor upgrades vehicles with armoring, the Executive Protection package allows clients to completely customize the interior cabin with an endless array of luxury features, conveniences, and options. Every Person, Place, and Purpose requires different protection levels. 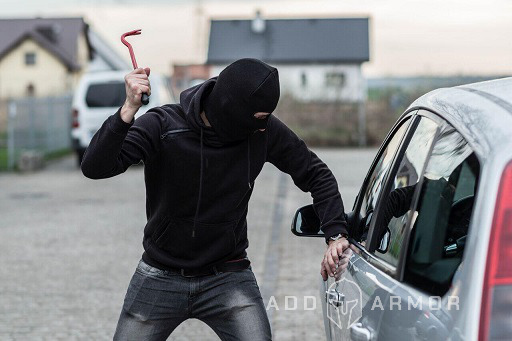 The first thing that you need to decide is what level of protection you require based on the potential threat. Take a look at our ballistic specifications chart. With so many options available, finding the level of protection that meets your specific needs can be difficult, but we’re here to help. Our highly experienced team is always available to advise and assist you. 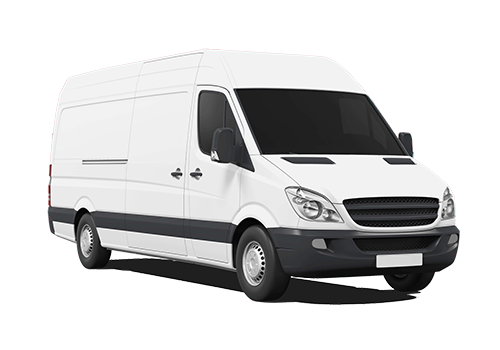 We provide continuous customer service and confidentiality before and after sale. 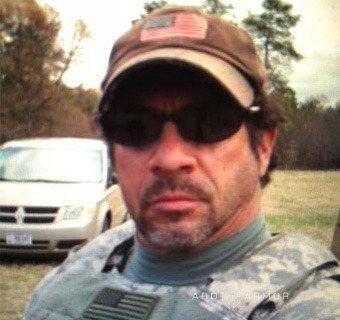 We are a veteran owned and operated business founded by, made up of, and connected to a vast network of first responders (special operations veterans, special agents, police) and successful business people. 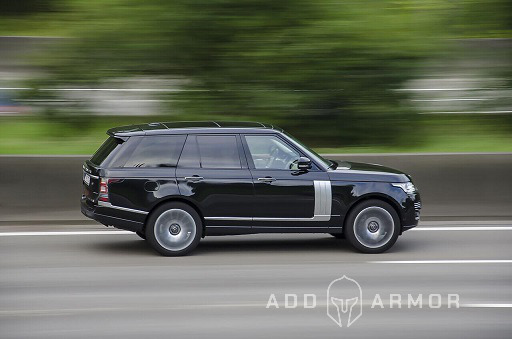 Our manufacturing team has built over 9,000 armored cars over the last 20 years. 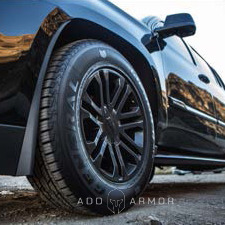 AddArmor® uses the most advanced composite armor in the world. It is 60% lighter and 10 times stronger than conventional ballistic steel. 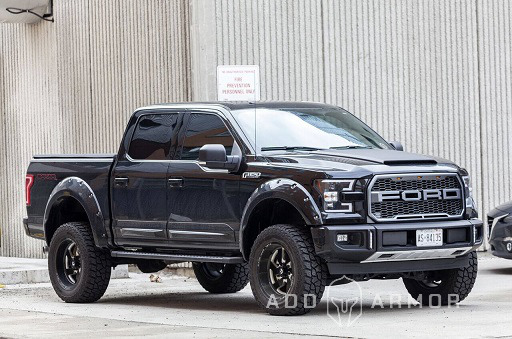 Lighter weight means better handling, better gas mileage, better braking, and a significant reduction in vehicle wear and tear. We stand by what we sell. 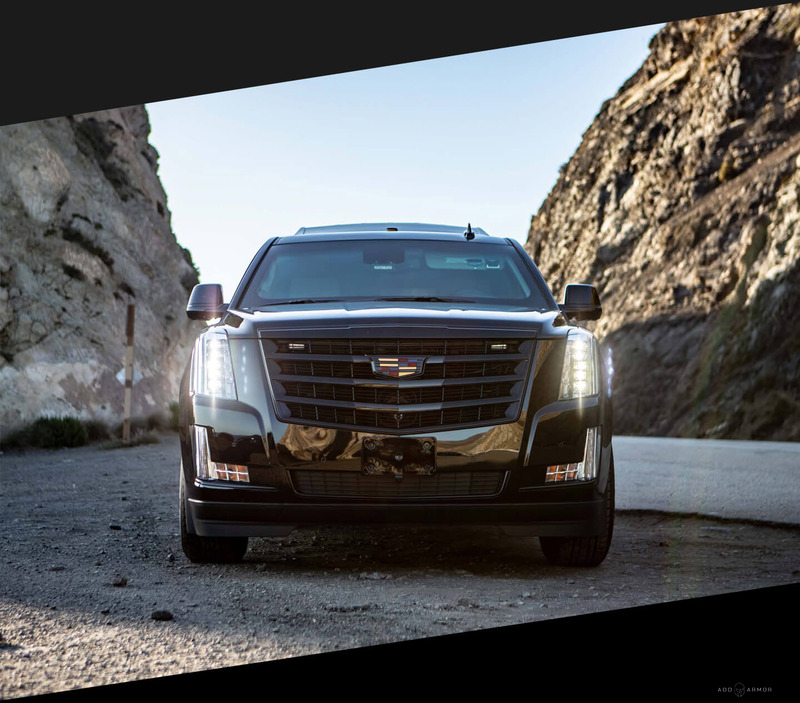 We stay with you and your vehicle after you buy it. Save your watermark as a template after you've created or uploaded it the first time. Access your template in the editor every time you watermark. Save your watermark as a template after you've created or uploaded it the first time. Access your template in the editor every time you watermark. Save your watermark as a template after you've created or uploaded it the first time. Access your template in the editor every time you watermark. Save your watermark as a template after you've created or uploaded it the first time. Access your template in the editor every time you watermark. Save your watermark as a template after you've created or uploaded it the first time. Access your template in the editor every time you watermark. 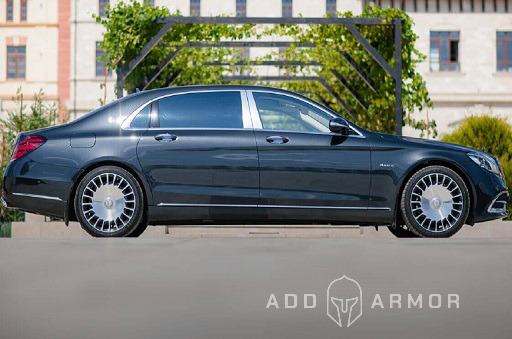 AddArmor is a premier vehicle armoring company that armors all makes and models of cars and trucks as well as all other types of vehicles (buses, construction, trains, etc.) 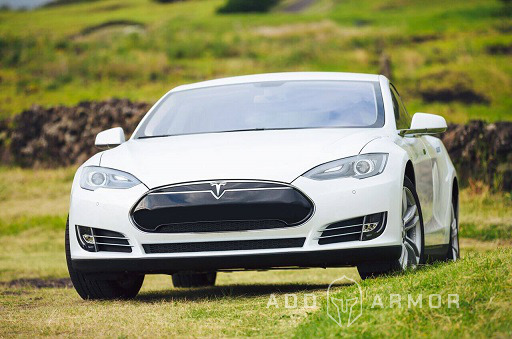 while always maintaining the vehicle’s original appearance and performance. 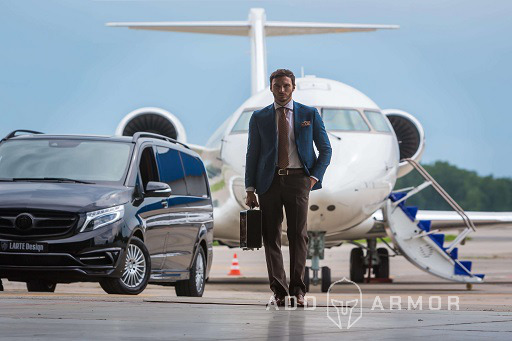 AddArmor partners with and is an exclusive distributor of ‘International Armoring Company’ and ‘Armormax’ products. 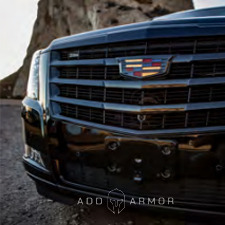 By using proprietary armoring designs and installation techniques as well as the latest lightweight composite materials, AddArmor provides the most technologically advanced armored vehicles available. 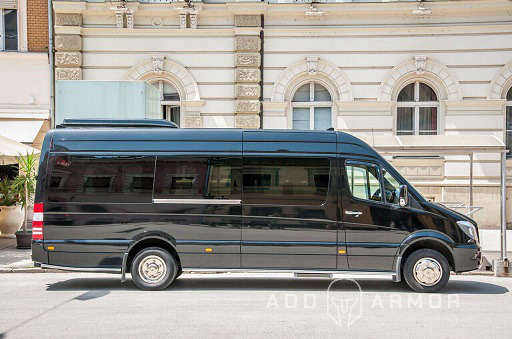 These vehicles have been delivered to heads of state, corporate executives, celebrities, SWAT teams, and civilian contractors all over the world. How Long? How Strong? How Heavy? How Much? 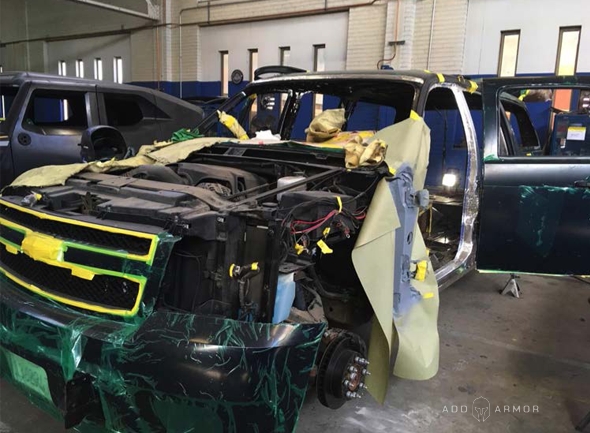 It takes about 600 hours to strip an SUV to its skivvies and armor it to the ‘B-6’ level of protection that can withstand hand grenades, a 12-pound landmine or rifle fire from an AR-15 and similar assault rifles. 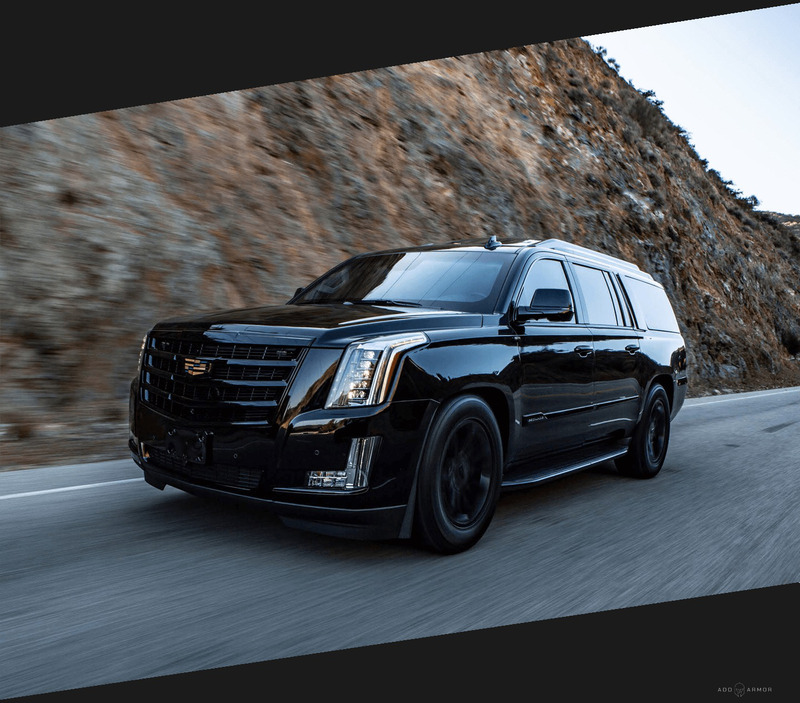 As an example, Armoring a mid-size SUV adds approximately 850 pounds to the vehicles 4,700-pound curb weight and $72,500 to the vehicle’s $38,000 base price. 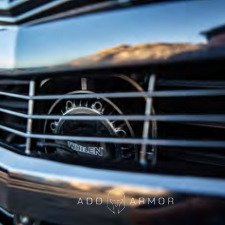 What are International Armoring Standards? 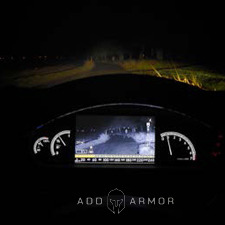 Numerous international organizations have developed armoring standards, defeat levels, and testing procedures. 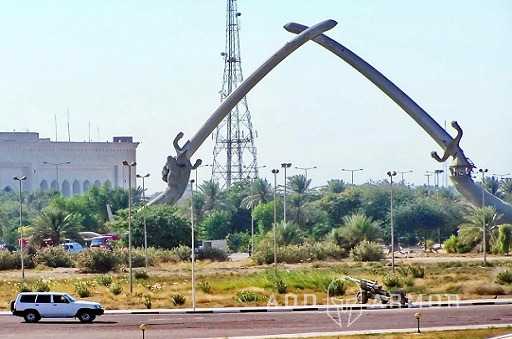 In the USA for instance, the standards were developed by the National Institute of Justice (NIJ), a procurement arm of the US government. In Europe the European Union developed their standard, called CEN, which is the B-Level standard. Other countries have developed their own standards. 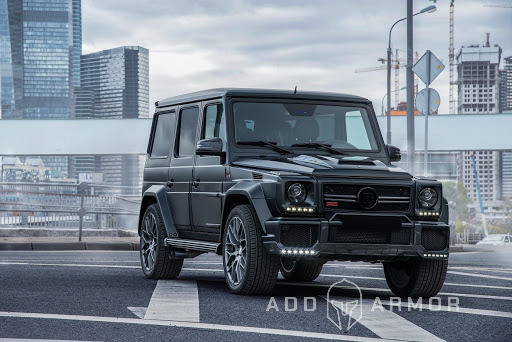 AddArmor generally adheres to European standards of armoring and security because they are stricter, more concise, and specific regarding armored passenger vehicles. 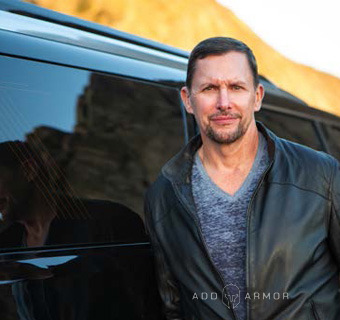 How is our Armor different than steel? 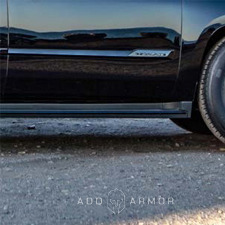 AddArmor® uses the lightest armor available in the world which reduces the added weight to an armored vehicle by up to 60%. 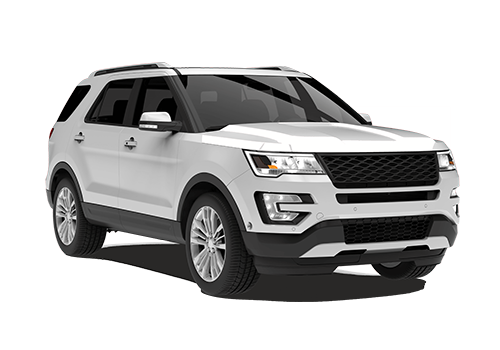 Lighter weight means better handling, better gas mileage, better braking, and a significant reduction in vehicle wear and tear. 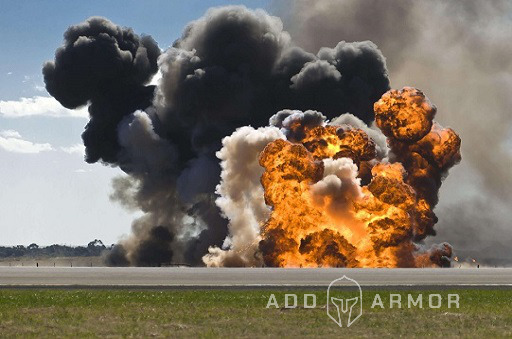 The technology (which was developed by International Armoring Corporation®) is pound for pound ten times stronger than ballistic steel. 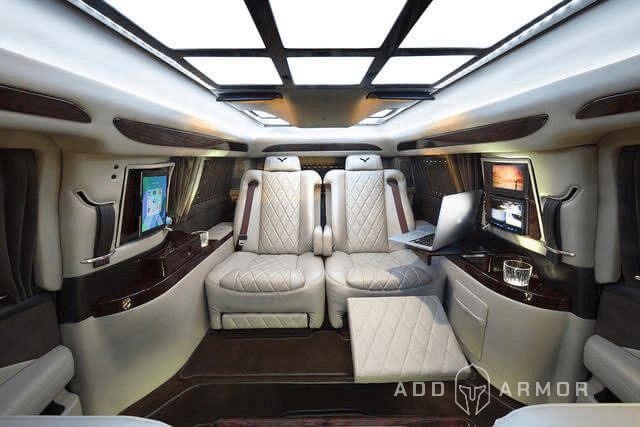 A transparent bullet-resistant high-tech pane of Glass + Polycarbonate for the protection of civilian and military armored vehicles, as well as public, residential and commercial buildings. It has been designed and developed to withstand high-energy ballistic impact and prolonged physical attacks, or a combination of the two. Success! Message has been submitted successfully. Error! Some error occured please try again.